Streaked, dirty, clouded, dust-laden windows in your home in Jindalee can be a very unwelcoming sight. That is why you need a good, dependable window cleaning service in Jindalee who have experienced window cleaners who will help clean the windows and remove the dirt, dust and streaks and give it its glow back. And a cleaning services company who specializes in window cleaning in Jindalee would be NCCS- Nooks & Crannies Cleaning Service. We at NCCS undertake both commercial window cleaning and residential window cleaning. To facilitate our window cleaning efforts in commercial buildings, our cleaners rely on rope access cleaning. When it comes to window cleaning, we believe in cleaning the windows both on the inside and outside. Only then will the windows wear that complete clean look. Depending upon the type of property or building in Jindalee, our window cleaners will use the apt gear, equipment, poles and as and when needed, will resort to rope access cleaning. At times, there are some very hard to reach windows, or the windows are set at different levels, in our efforts to clean every nook and cranny, our window cleaners do take to rope access cleaning. This of course requires experience and the right set of gear and ropes and experience which of course, the NCCS cleaners do have. Once your windows are all cleaned, you can catch the sunrays beaming into your home and the windows will look all clean and spruced up. This is the advantage professional cleaners like us bring to the table. 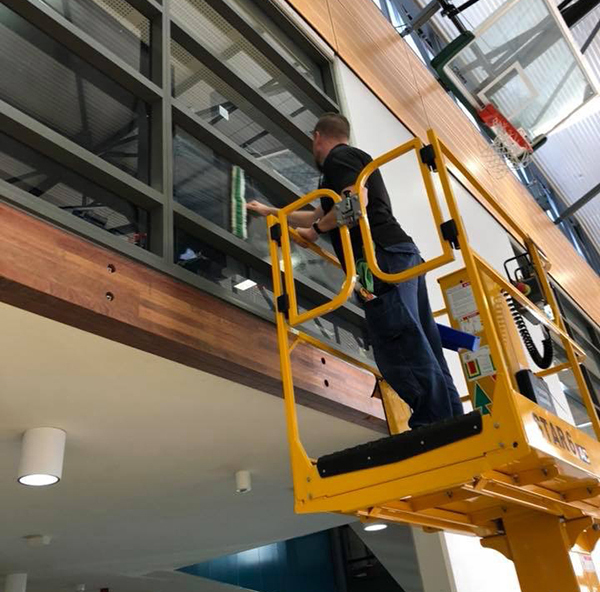 In the Jindalee roundabouts, if you are looking for the best commercial or residential window cleaning experts, then you need to touch base with the cleaning services company, NCCS. If you want to join our long list of satisfied and happy customers’ just give us a call on our number 0425 611 000 or email us at elsie@nccleaningservices.com.au / dave@nccleaningservices.com.au. Once you have engaged our cleaning services for any of our listed cleaning service offerings, you can be assured that you will also join our list of happy clientele.